1. Out of all the subjects available to study, what made you decide to research the connection between diet and spirituality? Back in the mid-1970s when I was searching for alternatives in psychology, I discovered the holistic health movement and its paradigm of the interacting dimensions of body, mind, and spirit, along with Eastern traditions like macrobiotics and Buddhism that emphasize the consciousness effects of diet. I was intrigued by the relationship and wondered about an explanation. This led to a master’s thesis in a holistic psychology program entitled “Nutrition, Consciousness, Spiritual Teachings, and Scientific Models.” The results were mixed. Some scientific models can help to explain nutrition’s consciousness effects, but only to a degree. More importantly, it became clear that nutrition may affect the growth of consciousness, but it shouldn’t be overemphasized at the expense of other factors like behavior and attitudinal changes. It also became clear that both vegetal and meat diets had advantages and disadvantages. The Yogi Diet takes all of this up and works it out in more detail, while also adding a special focus on grains (one of the keys to a vegetarian diet) and their critique by the low-carbohydrate movement. 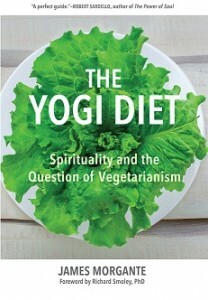 Ultimately, the book affirms the religious and spiritual importance of diet and the relevance of vegetarianism, but cautions against extremes. 2. Even though your book, “The Yogi Diet”, says it’s about “Spirituality and the Question of Vegetarianism” you spend an ample amount of time discussing secular diets such as Atkins, Paleo, the evolution of America’s Food Pyramid, etc. How did those topics make their way into the book? Spiritual traditions concern themselves with diet because diet affects health, and health in the holistic sense of body, mind, and spirit. Their special concern and expertise involve dietary effects on the spirit and spiritual development. But effects on the body and bodily health are also of concern, and here secular paradigms have much to say. If spiritual traditions, for example, recommend vegetarianism (as many do), because of the spiritual effect, the question remains as to whether a vegetarian diet is also healthy for the body. Conversely, if spiritual traditions denigrate meat and animal foods because of adverse spiritual effects, then we can expect to see such adverse effects reflected with the health of the body as well. In fact, the total record shows ambiguity on the part of religious and spiritual traditions on the question of vegetarianism because of advantages and disadvantages. Arguably, those same advantages and disadvantages, as well as the conditions determining them, are visible in the debates of secular paradigms focused on bodily health. In this sense, secular diets provide a check and a corroboration of spiritual views about vegetarianism. The goal of The Yogi Diet is to foster wisdom by synthesizing various points of view. In this process, secular views are also important. 3. You started your winding tale of spirituality and diet with Hinduism. Why start there? The book begins (and ends) with the Bhagavad-Gita’s dietary teaching because it is archetypical in several respects. First, its concern is health, or the nourishing and strengthening effect on the “mental, vital, and physical forces.” Second, its perspective is holistic, comprising the totality of the human being per its conception (i.e., the mental, vital, and physical forces; Western traditions speak of body, mind, and spirit). Thirdly, its teaching is unspecific, not naming individual foods, but judging diets by the health effect (i.e., different diets may well be appropriate for different individuals if the effect is healthy). Yet another archetypal aspect is the relative modesty of the importance attached to diet (four verses within a spiritual teaching comprising 700 verses). Finally, the Bhagavad-Gita as a Hindu spiritual teaching cannot be separated from the Hindu religious teaching of The Laws of Manu (chapter 5), of which the Gita shows familiarity. The Laws of Manu include detailed instructions about allowable and prohibited foods (like the Mosaic dietary code) as well as the conditions which allow and prohibit the consumption of meat. The Laws allow meat, but they enjoin minimal consumption and even avoidance as much as possible as well. Thus, the teachings of the Gita and the Laws of Manu complement one another. The religious perspective of the Laws (religion understood as the rules and practices governing a tradition) allows meat while questioning overconsumption or unnecessary consumption. The spiritual perspective of the Bhagavad-Gita (spirituality understood as the extra step of deliberately pursuing the path of “the good, the true, and the beautiful”) outlines a dietary criterion — health — that requires discrimination. Both together make up the totality of the tradition’s view about vegetarianism, which in the case of Hinduism is appropriately ambiguous. 4. Were you surprised how many variables play into a person deciding what to eat? Yes, I was and am surprised. When I first began to consider the topic of diet and spirituality, I thought that vegetarianism related to spirituality in a very simplistic way — eat vegetarian and become more spiritual. It turns out to be much more complicated than that, as evidenced by the ambiguity of religious and spiritual traditions about vegetarianism. We are all individuals, which means that we have individual capacities and needs, and the ambiguity about vegetarianism reflects this. I also think it’s fair to say that widespread interest in low-carbohydrate diets reflects to some extent an intuitive grasp of the need for animal food. As I indicate in The Yogi Diet’s introduction, I wanted to grapple with the low-carbohydrate movement and its critique of grains and the agricultural revolution, but expected the movement to reveal itself as regressive because of the conventional dietary wisdom that de-emphasized animal foods because of potential deleterious health effects. In contrast, I found that alleged adverse effects depended on variables such as the totality of the diet and even food quality. Mixing carbohydrates and fats can quickly lead to health problems, but low-carbohydrate diets themselves like the Atkins Diet can, in fact, improve health. And then there are other considerations — like the inability of some people to generate sufficient fat, thereby needing fat from animal foods; the beneficial stimulation that meat can provide from a spiritual perspective for living in the world; and the importance of spiritual practice to keep the effect of a vegetarian diet healthy. Thus, there are many variables to consider that invalidate simplistic associations like “eat vegetarian and become more spiritual.” Such a notion, in fact, can lead to trouble. 5. Do you personally feel people should make dietary decisions based on their religion? I would say that the religious and spiritual perspective on diet is something important for everyone to consider, namely, that diet has effects beyond those on the body on the mind and spirit as well. Yet the perspective of one religious tradition alone may be insufficient. Jainism, for example, requires vegetarianism, yet the question remains as to whether vegetarianism can healthy for everyone. Moreover, Western Christianity has largely come to ignore the significance of biblical dietary restrictions like the blood prohibition (Genesis 9: 4 and Acts 15) for keeping the vegetarian undercurrent alive. A synthetic understanding of the totality of religious, spiritual, and even secular views is the key to developing sound judgment. 6. What dietary prohibition did you find the most surprising? The Jainist prohibitions against fermented foods to avoid harming microorganisms and against root vegetables to avoid uprooting plants and thereby harming them. As for surprise about what is allowed, or what can make something allowed, there is the indication of Swami Prahhupada (an interpreter of the Bhagavad-Gita’s dietary teaching) that spoiled foods and those cooked more than three hours previously are untouchable unless blessed (prayer trumps everything)! 7. Let’s get to the question my drunken readers want asked, what about alcohol? Is it good or bad? Appendix B goes into detail about alcohol. Briefly, religious and spiritual thinking about alcohol is as diverse as it is about vegetarianism. Nevertheless, many weighty considerations argue against its use, particularly for spiritual seekers. One important consideration indicates that alcohol usurps ego functions, which are important for spiritual development. In this sense, alcohol can be considered to have a counter-evolutionary effect. 8. Now that “The Yogi Diet” is out, what is your next project? As I indicate on my Goodreads author profile, I think of the The Yogi Diet as the first of an interrelated trilogy. The second, Mother Cow, will take up cow worship in “third-world” Indian culture as a reflection of the importance of lacto-vegetarianism and contrast such a devotional attitude with the treatment of farm animals including cows in “first-world” U.S. culture where they are exempt from animal cruelty laws. The third will focus on the complementary nature of reincarnation and resurrection, two afterlife teachings associated with the cultivation of grain (chapter 6 in The Yogi Diet) that are keys to realizing the vegan-vegetarian religious ideal (chapter 8). 9. What did you eat today? For breakfast, I had a fried egg and a bowl of steel-cut oats, soaked overnight and rinsed (very important for removing antinutrients), then cooked and topped with extra-virgin olive oil, some honey and coconut sugar, shredded coconut, raisins, banana, and yogurt. This is my typical breakfast, but the grain and toppings vary. For lunch, I had a salmon burger with sauce, sauerkraut, and lettuce on a piece of whole-grain bread, along with a few raw mini-carrots (the salmon burger is untypical; a veggie burger or a rice bowl with some dairy is more typical). For dinner, I had toast with butter, miso, and tahini, a salad, and some cooked vegetables. Occasionally I eat fish, and less frequently, chicken. I am sympathetic to the vegetarian cause, but not a strict vegetarian. Which is more important — food variety or food quality? I have to say food quality. What’s the point of a wide variety if it tastes bland or stale? 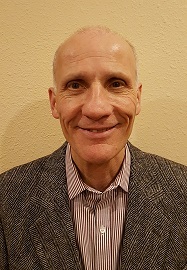 James Morgante, MDiv (religion), MA (psychology), has worked in ministry, social services and teaching, and has been studying the relationship between spirituality and nutrition for over 30 years. Shortly after receiving his undergraduate psychology degree, he began a pursuit of alternatives in psychology that led him to the holistic health movement in the 1970s, and to an eventual ministry focus. From 2007-2015 he taught English in China, all while maintaining his studies in vegetarianism and spirituality. He has always been keenly interested in the subject of vegetarianism and the spiritual life, wanting to learn why some religious teachings advocate vegetarianism (yet most don’t require it), why some have an ambivalent attitude, and why some pay no attention to the subject, or even reject it. The Yogi Diet is the culmination of his studies. James speaks to church and hospital groups. He lives in Seattle, Wash.